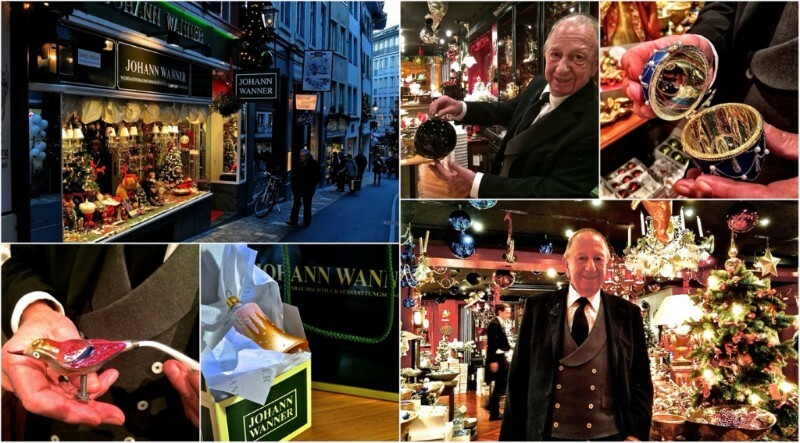 Basel’s Mr Christmas – There is no-one who personifies the spirit of Christmas as much as this Basel citizen, Johann Wanner. Impeccably attired as from another era, this “Couturier of the Christmas Tree” has, for many years, quietly co-ordinated the Christmas decorations for the rich and the powerful from sundry Royal families, to the White House and even, his Eminence, the Pope himself. His year-around Christmas store has enormous displays of ornaments in every colour, size, shape and design – handmade by a team of craftspeople (or pixies) who specialise in making and supplying one style of bauble only. These miniature works of art are stunning: from the little humming bird which has a tail made from strands of crystal glass to his own favourite – the large, black glass bauble which comes into its own in the shadow. For his own tree? He always picks the worst tree he can find to take home – both for the challenge and because it is so grateful to be selected, it more than repays the effort of adornment. Pop into his shop when you are next in Basel and try to decide which to buy over a glass of champagne and a slice of spiced apple cake. If you love Christmas, this is unbeatable. Basel Tourism is a client of Magellan PR. For more information, contact Alexandra Pinhorn (alexandra@magellan-pr.com) +44 (0) 7515 283 040 or Sue Lowry (sue@magellan-pr.com) +44 (0) 7725 997 121.